The flexographic end-user Plásticos Romero and the consultant company Incotec proposed to have another meeting with Pure Air Solutions, Universitat de València and Innopack in order to evaluate the next steps for the possible installation of the Boncus technology in his facilities. This meeting was held at Plásticos Romero’s factory in Murcia on Monday 13th June. 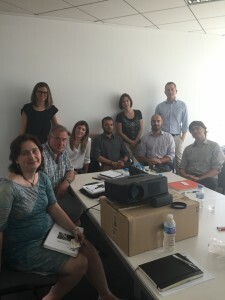 On Tuesday 4th of June, Carmen Gabaldón and Albert Waalkens (scientists in charge of Universitat de València and Pure Air Solution respectively), Dr. Feliu Sempere (experienced researcher of the project), and Daniel Vílchez (manager of Innopack) had a very nice meeting with the manager and staff responsible of R&D and the quality and environment departments of Plásticos Romero (an important flexographic company in the Spanish Region of Murcia). The meeting was held at the facilities of the Incotec in València, an environmental consulting company that operates in the whole territory of Spain, who is contracted to study the different technologies to remove solvent emissions. The meeting was very interesting, and helped both the end-user and the consultancy to know better the advantages of the Boncus, where solvents are converted into bio-methane. Coordinator Camen Gabaldón was invited to participate on Tuesday 5th of May in a workshop organized by the Equality Unit of the Universitat de València regarding the inclusion of equality in scientific research (link) . She made a practical presentation about her experience in the two European projects that she is coordinating (Next Air Biotreat and TrainonSEC).